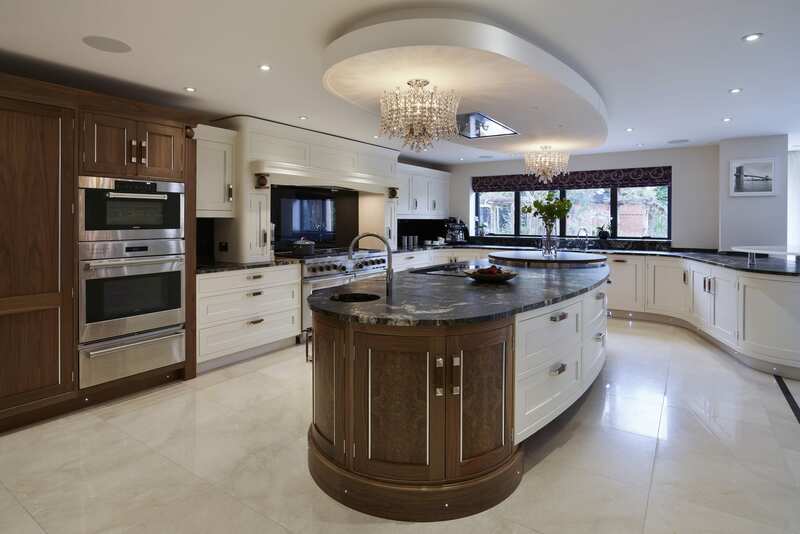 A luxury kitchen designed to wow, exuding glamour, opulence and of unsurpassable quality. 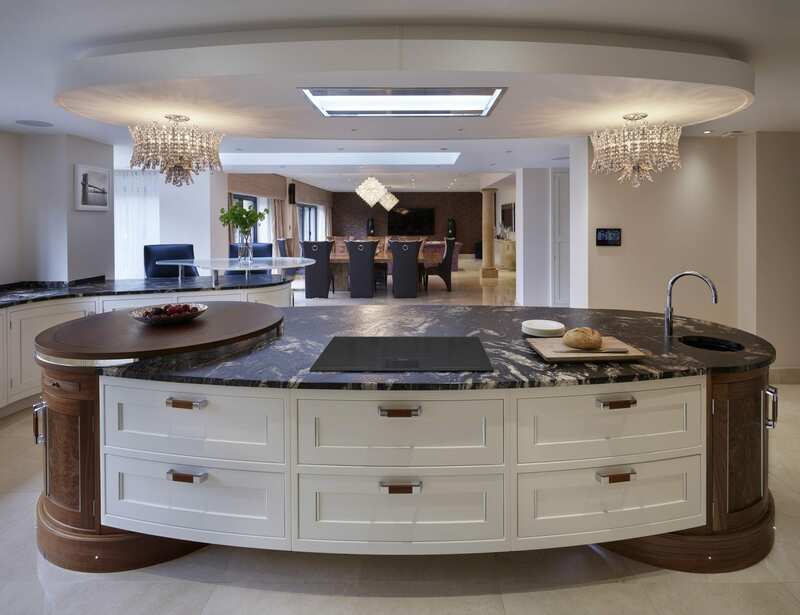 The brief behind this Belgravia inspired kitchen was to create a stunning room with a wow-factor kitchen island that was a pleasure to entertain in. 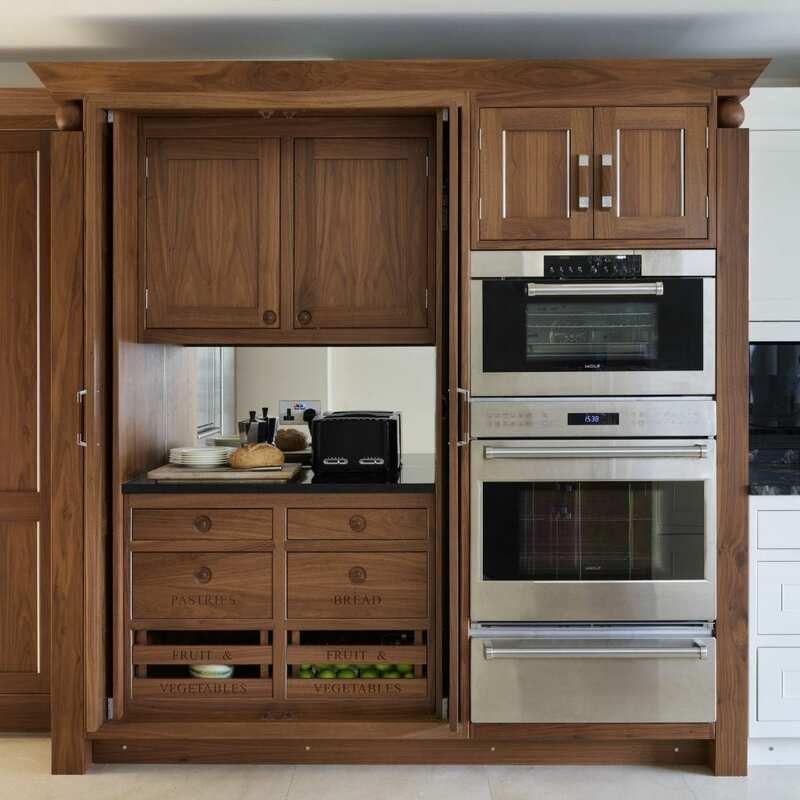 Our client, Mrs M, was also keen to create a kitchen that would add value to her home, and having seen Davonport in several estate agents’ listings, she felt a bespoke Davonport kitchen was the way forward. 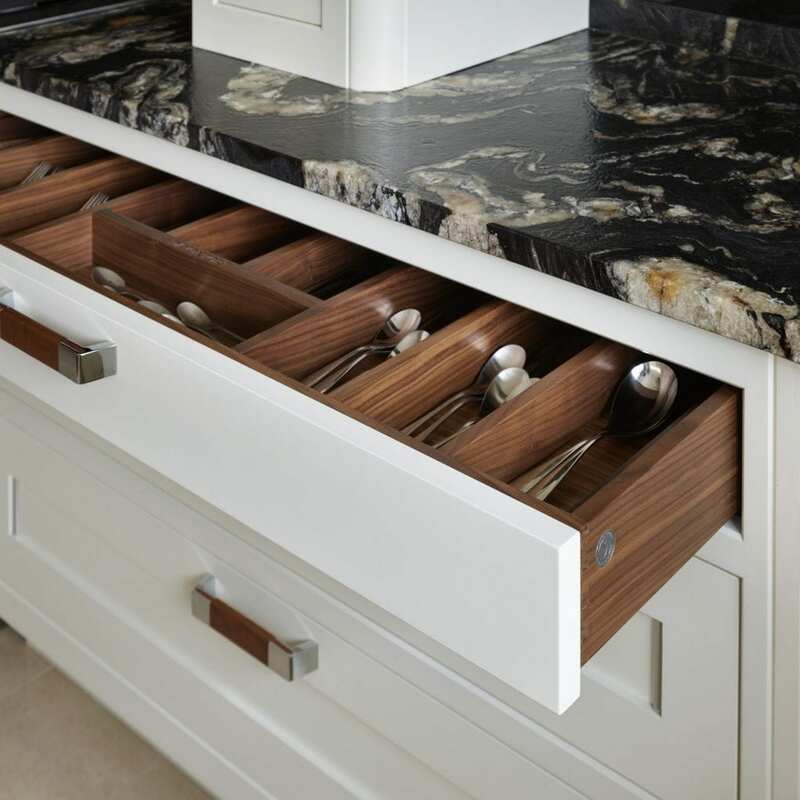 Our Belgravia kitchen style was the inspiration behind the furniture design of the room. 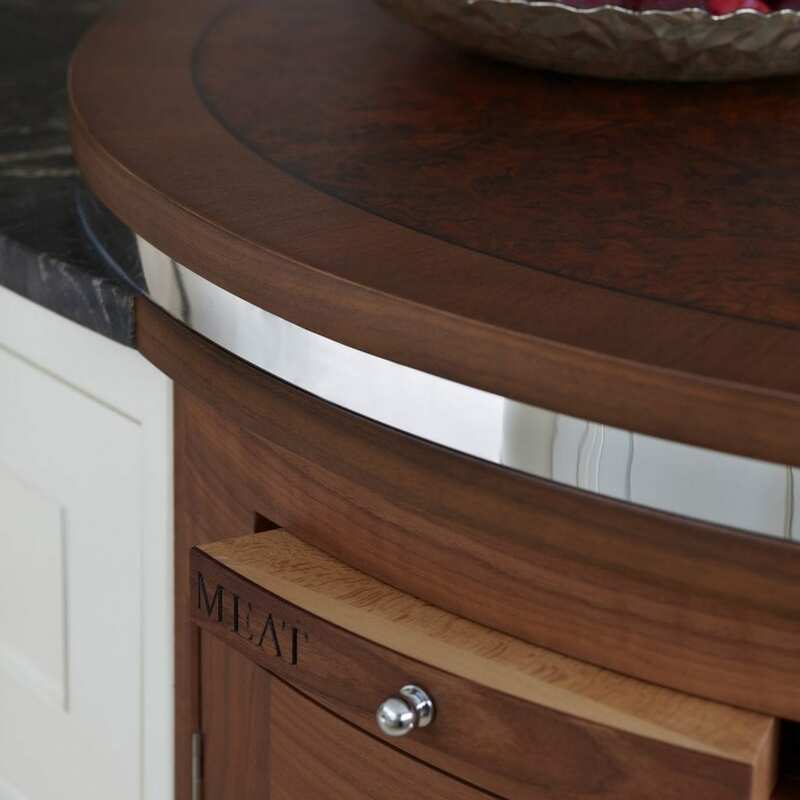 The silver bead detail on the door, and the combination of off white hand-painted cabinets and walnut features immediately creates a sense of luxury. 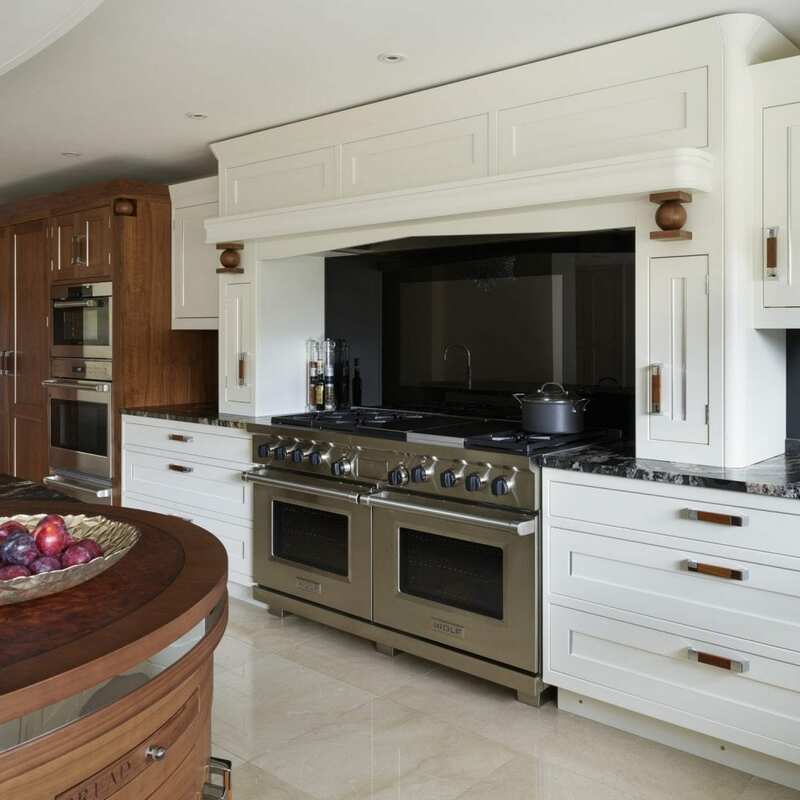 The burr walnut detailing on the curved cupboards at either end of the island enhance the opulent and grand feel of the space with the impressive mantel framing the range cooker really adding to the overall wow-factor of the design. 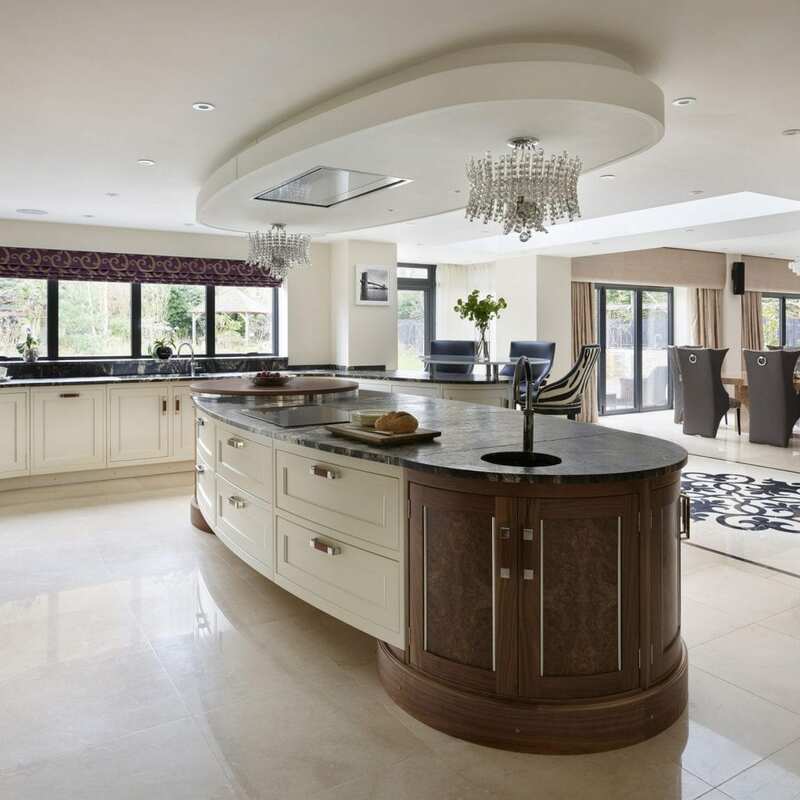 “I wanted something luxury and something that would turn heads, so I loved the walnut aspects and the grand scale of the whole design,” explains Mrs M.
The pièce de résistance of the room is of course the floating kitchen island: “The island always gets commented on by guests; it’s a real showstopper, which is exactly what I wanted,” said Mrs M. She came to us with the desire for a totally unique island, and after some discussions with Richard Davonport – Founder and Managing Director of Davonport – a floating kitchen island became the dream. 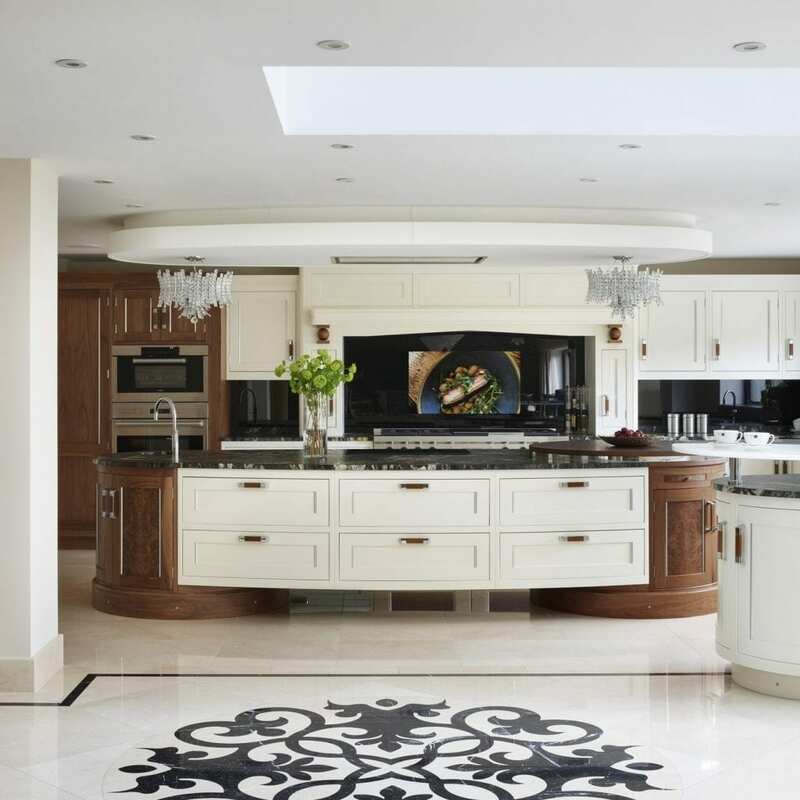 “I was desperate to have a totally unique kitchen island, so when Richard came up with the design that featured a floating island and had found a way to construct what I was looking for, it was so exciting.” The bespoke circular cupboards at either end support the central section of the kitchen island, creating the stunning bridge effect and impressive visual impact of the floating island. The entire island is curved, with a gentle bowed profile. 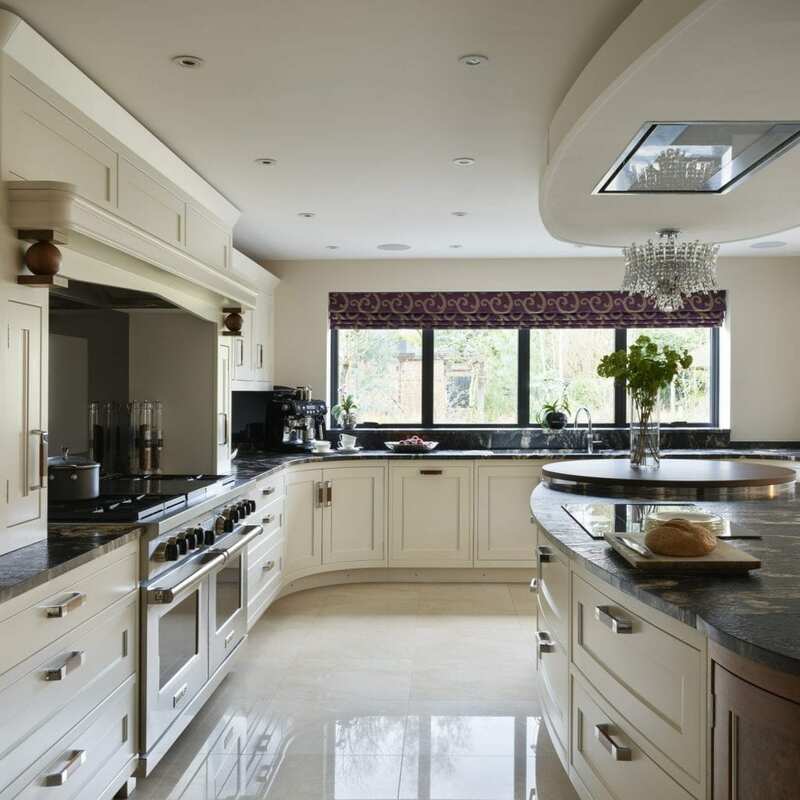 The ceiling box above the island echoes its shape and conceals the ceiling extractor above the induction hob. Two chandeliers, positioned at either end of the kitchen island, give the room extra glamour with spotlights dotted throughout to provide practical lighting. 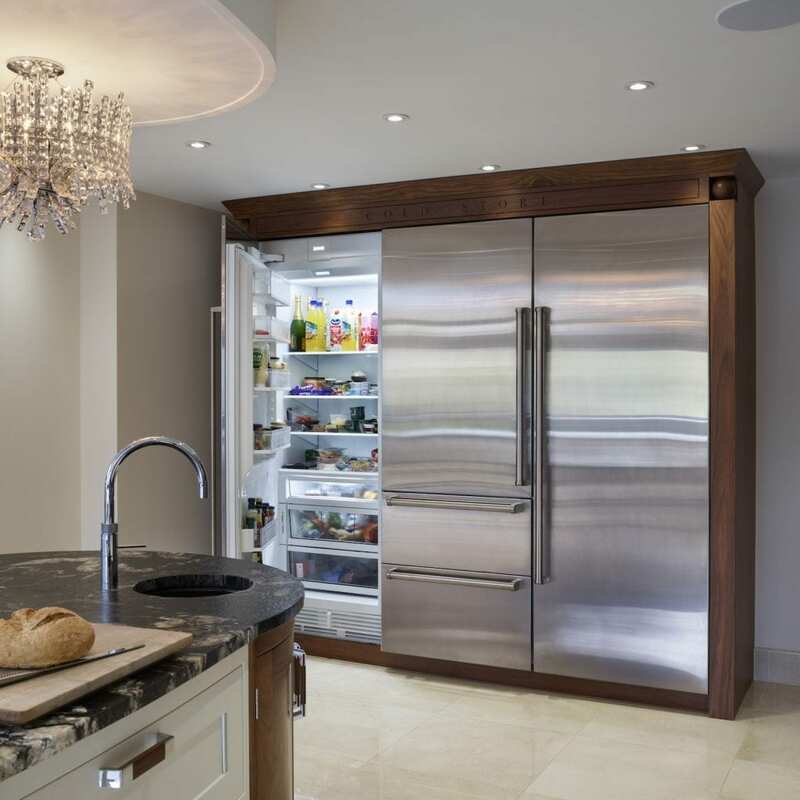 In addition to this, the room also benefits from spotlighting along the plinths and colour changing lights concealed above the wall cupboards on the back wall – perfect for entertaining guests. Located behind the range cooker (behind toughened glass) is a television, one final flourish in this kitchen’s unapologetically grand design. “I hoped that the kitchen would become the main entertaining space for us and an easy place to cook and enjoy meals with ten plus people. This has definitely been the case, guests just flow in and out and continue to be amazed by just how stunning the whole room is,” concludes Mrs M.